The Hundreds – Did They or Didn’t They? There’s a little bit of a heated debate over at You Thought We Wouldn’t Notice about whether or not The Hundreds copied artwork for one of their spring prints. The site is known for its mud-slinging and the comments section is the mud pit. The shirt in question is Los Cientos and the design was originally from a Mexican board game called Loteria. I, for one, don’t have an opinion on the matter because I don’t have all the facts. Were they given permission to pay homage? Is there a backstory to the changes in the design that makes everything come full circle? I am going to assume that The Hundreds are not claiming the design and print are coincidental. It would be interesting to hear their side of the story. 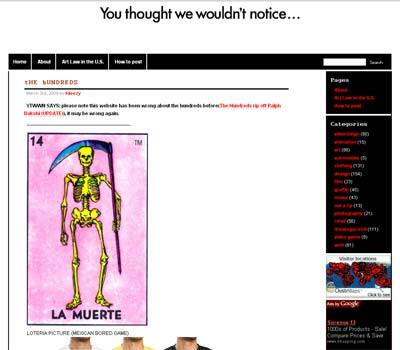 After all, they call the shirt theÂ “Muerte Tee” on their online shop. Either way, brand reputation and integrity is very important and you have to monitor the internet these days to hear the chatter. Whether it’s true or not….you have to defend your brand’s rep against the haters. All the LoterÃ­a artwork are trademarks from El Gallo since 1887….